We are one of the fastest growing mechanical engineering design service providing companies based in India. With the right mix of talent and technology, we help manufacturers, design engineers and independent engineering firms to reduce mechanical product development time and associated costs, providing them the opportunity to bring products to the market faster. We are specializing in 2D CAD Drafting, CAD Design and 3D CAD modeling services for various industry verticals such as Building products, Metal furniture manufacturers, Industrial plants & products, Heavy machinery, Fabricated metal and alloy manufacturers. We provide mechanical design and drafting solutions using SolidWorks, Autodesk Inventor, DriveWorks, Pro-Engineer, Solid Edge, Autodesk P&ID, PTC Creo. By 2020, we aim to position ourselves as a leading end-to-end mechanical design services provider firm across the globe, with state-of-the-art infrastructure facility, technology capabilities and talented pool of mechanical engineers. 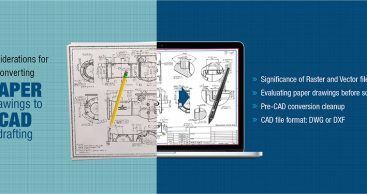 To consistently remain one of the top mechanical design engineering service providing companies, and support manufacturing and engineering firms across the globe, in achieving their product development and business goals using best-in-class digital design tools. Our engineering facility is equipped with industry leading software and hardware infrastructure, both flexible and scalable to manage large and complex volumes of engineering data. Contact us or browse through our services and projects pages to know more about our offerings and service expertise.